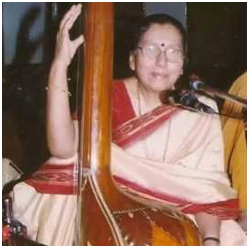 Kumudini Katdare is a veteran vocalist and teacher of the Jaipur-Atrauli gharana. She received her initial training from Narayan Raghunath Marulkar, a scholar-vocalist and harmonium exponent of the Jaipur and Ghwalior gharanas, and Ratnakant Ramnathkar ‘Premrang’, a senior vocalist of the Agra gharana and disciple of Vilayat Hussain Khan and Faiyaz Khan. She then went on to train in Jaipur gayaki under Kamal Tambe, senior disciple of the legendary Mogubai Kurdikar. She has also received training and guidance from Mogubai Kurdikar herself and Kishori Amonkar, and also Madhusudan Kanetkar (disciple of Bhurji Khan). Having received erudite taleem, Kumudinitai’s gayaki combines tradition, aesthetics and intellect. Endowed with a sweet, smooth voice her presentations are rich with bhava and at the same time show a great depth and keen understanding of the raga. Her presentations have received great critical appreciation. She is also a composer of great merit, having composed many madhyalay and drut Khayals, Taranas, Bhajans, and Raagmaalas. Apart from raag-sangeet, she is also adept at singing lighter forms and Natyageet. She has been instrumental in imparting her wisdom and training several musicians like Madhuvanti Deo, Anjali Malkar, Shubhada Marathe, Dhanashri Ghate, Nita Mutalik, Shilpa Prani-Athaley, Jaanvee Prabhu-Arora, and several others. Kumudinitai has been performing for over 55 years, and has performed in many major conferences and concerts like Alladiya Khan Sangeet Samaroh, Sudarshan Sangeet Mahostav. She is a Top Graded artiste of AIR and broadcasts regularly. She has received the prestigious Surmani Sursingar Sansad award. She was invited to perform at Laxmi Vilas Palace, Vadodara by H.H. Maharaja Ranjeet Singh Gaikwad on 6th September 2011.